Souvenir: a thing that is kept as a reminder of a person, place or event. 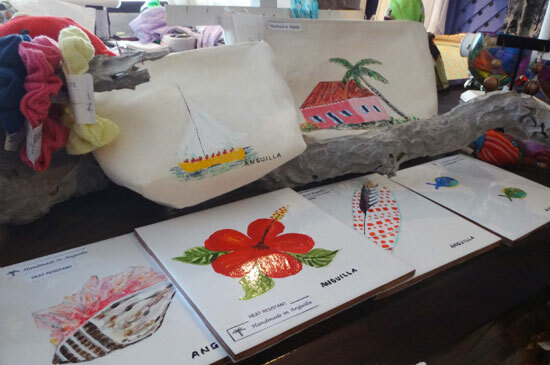 Whether you need a reminder or not, Anguilla has many beautiful souvenirs to take home with you so that can keep the memories alive. To see it everyday? Now that is magic! Bring the beauty of Anguilla home with Anguilla Beaches' photos and canvases. High quality photo prints and canvases are available in a variety of sizes. They can be shipped directly to your home in the US, Canada, UK and abroad. They can also be purchased and delivered on-island, and they make excellent gifts. 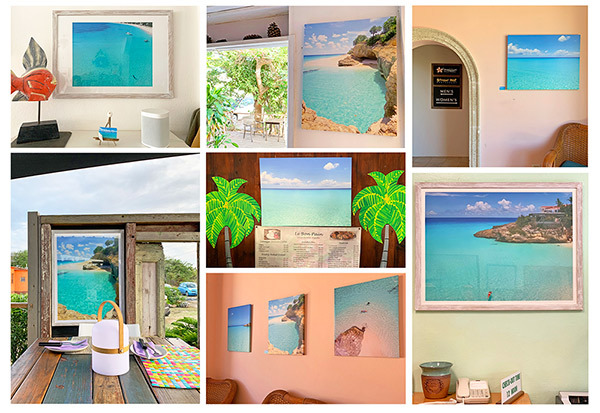 If you are on-island, keep an eye open for the prints and canvases on display at Frangipani, Carimar, Le Bon Pain, Artisan and Limin' Boutique! Limin' Boutique is a "beachy boutique" that does tons of research and inserts great thought and effort in to the products they offer. There are many unique items in their boutique and if you are looking to walk away with a piece of Anguilla, they have you covered. 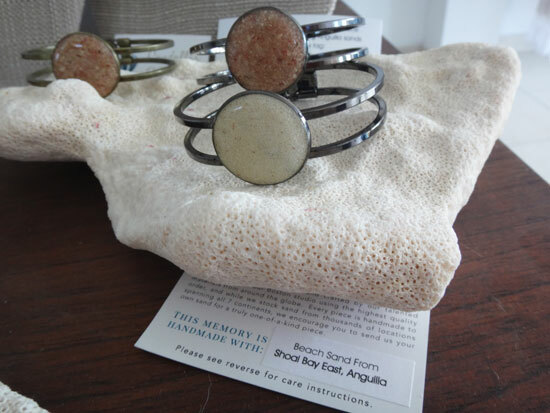 Anguilla may already be in your heart, but how about wearing a small piece of your favorite beach around your neck? Or have you visited during boatracing season and found a love for Anguilla's National sport? You can own a piece of an actual sail from a real Anguilla racing boat and in a very stylish way, all thanks to Limin' Boutique in the West End. 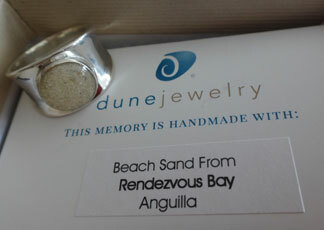 First, their dune Jewelry with sand of Anguilla's beaches is unique to Limin'. 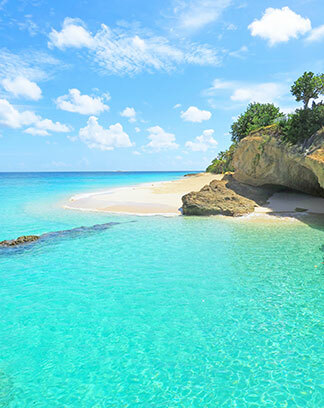 Bracelets, earring, necklaces, rings and even a wine stopper are either sliver plated or sterling silver and contain a small portion of some of Anguilla's most popular beaches. Note, I did say "small portion". Given that sand-mining is a unfavorable act, rest assured that the sand used for this jewelry is minimal as it's not mass produced and tiny amounts are used for each piece. In other words, you may accidentally take home more sand in your beach bag than is used in each piece. The pieces are naturally beautiful and vary as the sands of Anguilla's beaches do. The day my mom and I visited, the beach sand pieces that were included in their inventory were from Little Bay, Rendezvous Bay, Shoal Bay East, Junks Hole, Meads Bay, and Maundays Bay. They even sell a blend of Anguilla's top 5 big beaches. It's labeled as "Beaches of Anguilla" and includes a mix of sand from Shoal Bay East, Shoal Bay West, Cove Bay, Rendezvous Bay and Meads Bay. You can be the judge of which is the whitest! Surprisingly, the Junks Hole sand jewelry is the most unique in color with a beautiful salmon tone. 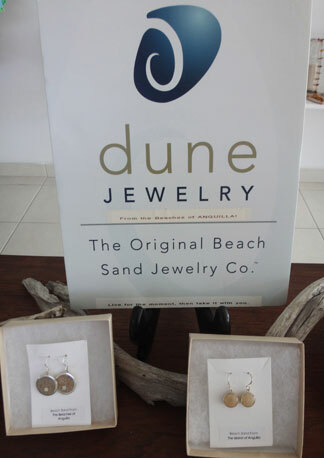 The 'dune Jewelry' makes a nice keepsake for yourself or a gift. It's not the only reason to stop in to Limin' but you won't find something like this anywhere else on the island. Likewise with their sailbags! I loved these as I'm a big fan of boatracing and so of course, my first question to the owners of Limin' was, "what boat's sail are these bags made of?" The next round of bags in stock later in 2015 will be made from the sail from the racing boat 'No Big Ting'. What a great way to recycle too! The bags varied in size and style. They carry large and smaller totes, messenger bags, toiletry bags and wine bottle carriers. Anguilla racing boat "Light & Peace"
At Limin' you could combine a gift of a wine stopper with sand from Anguilla and pair it with a bottle of wine (purchased elsewhere) and present it in an Anguilla racing boat sail wine bag and make a wine-drinking Anguilla fan very happy. One last item my mom noticed on our way out of Limin' is something very important and also exclusive to Anguilla and its heritage - they carry DVD copies of David Carty's "Nuttin Bafflin" documentary film. If you've found a love for Anguilla, its heritage and history or just love the beauty of sailboats - this is the perfect souvenir. 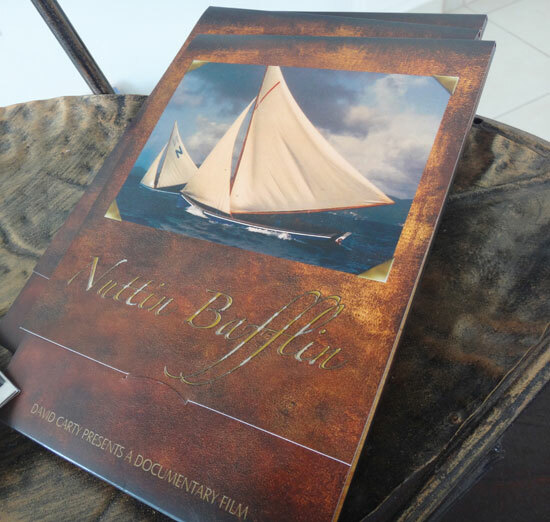 The book came first (before the DVD was released) but it's harder to find and the film of course provides visuals of the beauty of Anguilla while telling the story of it's history of boatracing. I recommend picking up a copy! Next stop - ZaZaa Boutique in South Hill for handpainted trivets and clutches and Caribbean Soap and Sundries. I had only experienced ZaZaa's shop at Anacaona Boutique Hotel in the West End. Lo and behold, they have another location they call their "outlet" that's located in South Hill. There is a sign on the main road indicating where to turn. They have a nice display of hand-painted trivets and small clutches that are easy to travel with. Also on hand at the outlet but more notably displayed at their flagship location are the coveted Caribbean Soap and Sundries. 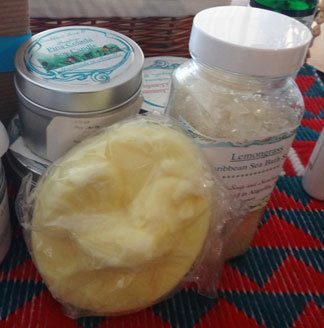 Lovingly handmade in Anguilla and beautifully scented, their line of goods includes candles, soaps and lotion bars. They are perfect size for travel and their scent can evoke sweet memories of your time on-island. Sea Spray Gifts and Smoothies. A benefit of Sea Spray, besides its convenient location by the Sandy Ground roundabout, is the option to sip a refreshing smoothie while shopping. 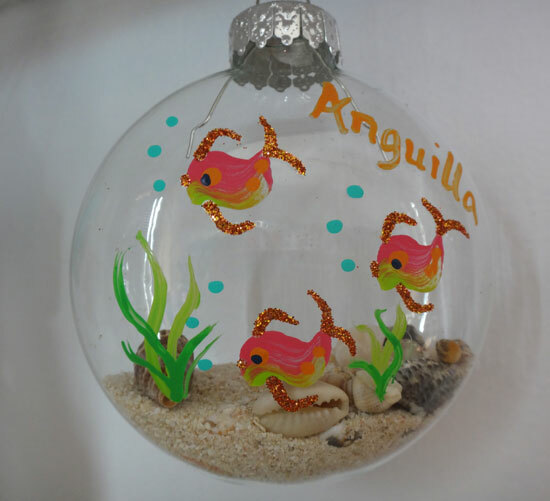 Stop in and have a look at hand-painted ornaments complete with Anguilla sand and shells. You might even catch some being painted while you visit. 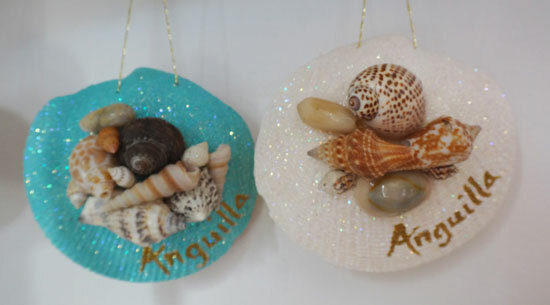 The ornaments made of clam shells are harvested directly from Anguilla's Scrub Island too! Last but not least, I think it's safe to declare that many people like to mark their vacation with a t-shirt from the destination. I know I do. 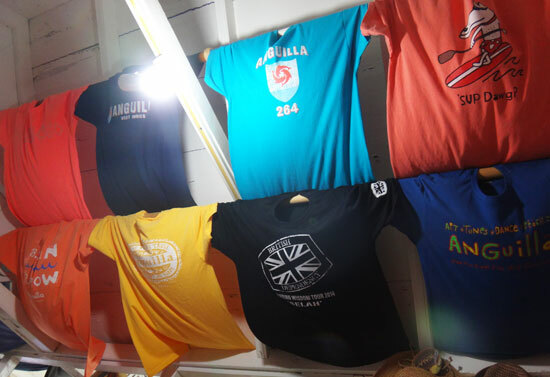 The absolute best place for your Anguilla t-shirt is Irie Life. 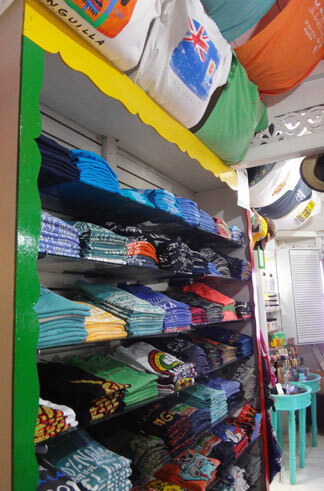 Irie Life has the largest selection and in my opinion, the coolest selection of t-shirts on the island. They cater to children and adults and their designs range from classic to dive-themed to comically cute. The quality is great and they offer the rainbow in color choices. Irie Life is also known for supporting Anguilla's talented musicians. Check there first for your copy of local artist cd's and take the sounds of Anguilla with you, you won't be disappointed. Anguilla's first jam, Anguilla's Jammin' is an all-Anguilla jam, produced and sourced on-island, powered by eco-friendly aquaponics! With bright, vibrant and flavorful creations, including Hot Jamn, Kool Kiwi, Paw Paw Melon, Passion Fruity and Mashed Up Mango, these jams taste as good as they look. More on Anguilla's Jammin. 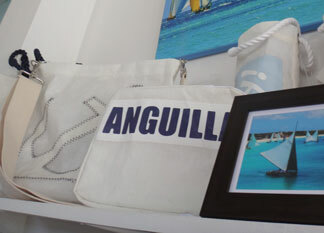 Anguilla Souvenirs on the Web! When you're not in Anguilla to buy a souvenir? Some of the most interesting and unusual souvenirs can be found on the web, specifically on eBay. I've pulled together the coolest collection available on eBay. It's a wild assortment of rare gold and silver Anguilla coins, books, stamps, flags... even license plates! There's a whole bunch of really rare and interesting Anguilla memorabilia and collectibles. 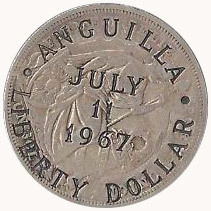 For example, an old Anguilla automobile license plate will only set you back a few dollars, but a mint condition gold coin may cost thousands. Right-click on this link, copy the link's URL and paste it into your RSS feeder, iGoogle, My Yahoo!, My MSN, Bloglines or any other RSS reader you are using. You will be able to follow what's available in real-time and be notified as soon as the inventory changes. For more information on eBay and Anguilla, see this Anguilla Facebook post. Have fun with your Anguilla souvenir-hunting!